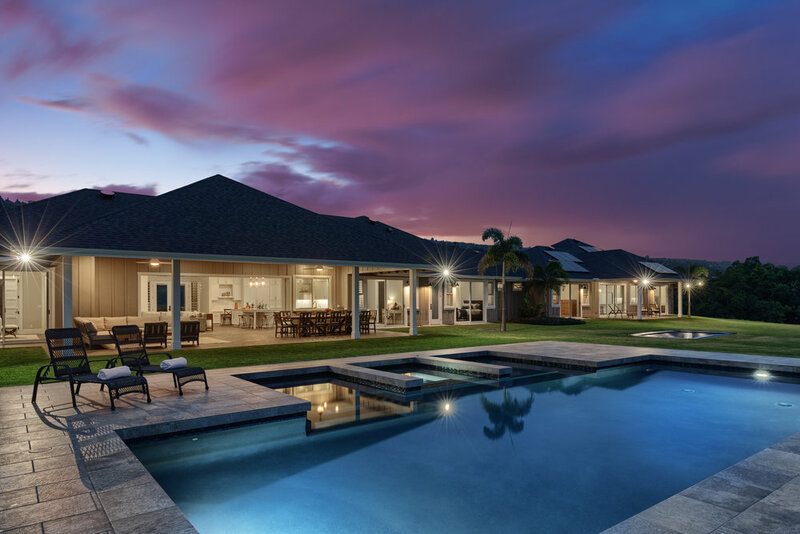 This newly constructed home in the Pauoa Beach community within Mauna Lani Resort on the Big Island showcases modern, elegant Hawaii living at its finest. From the copper entry accents, Venetian plaster walls and Koa cabinetry to the coral stone, travertine, and mahogany floors, the finest materials were used in the construction of this home. Every detail of the five bedrooms and five and three half bathrooms is skillfully crafted to create a refined simplicity in each space. Designed by Architect Matthew Kilgore to blend boundaries between indoor and outdoor living spaces, this home enjoys beautiful ocean and mountain views. Step out of the circular dining area to cook with Viking appliances poolside in the outdoor kitchen. This home features an outdoor shower and powder room designed specifically for easy outdoor access from the beautiful infinity pool. Use the private elevator to reach two bedrooms, each with their own bathrooms, a large living and theater room, and expansive lanais. In addition, the detached, one bedroom, one bathroom guest suite provides plenty of space and privacy for guests. The three-car garage even includes a tiled shower for sandy feet; the beach is only a short distance from the home. Kukio is a premiere residential membership community on the Big Island of Hawaii. Located on the Kona Coast, members enjoy the unsurpassed amenities of the Kukio Golf & Beach Club. This architectural beauty includes every luxurious detail you can imagine. Constructed on an expansive estate within the Maniniowali community at Kukio on the Big Island of Hawaii, the home design seamlessly reflects an expansive natural setting. Surrounded by vast skies and the unique, lava-shaped landscape of Hawaii, this luxury residence makes a statement without sacrificing the comforts of daily life. A stunning fire and water feature incorporated into a natural rock wall welcome guests to the central living space, which includes a bright kitchen, open living and dining areas, a spacious office, sprawling lanais, and luxurious master suite. Four additional guest suites, a three-car garage, and abundant storage spaces are split into three surrounding buildings, creating abundant privacy and comfort. Opening to spectacular sunset views over the Pacific Ocean, the lanais provide an ideal space for entertaining, with an outdoor grill and bar and several intimate seating and dining areas. This sophisticated home was completed in 2012 and enjoys views of the distinctive Pu'u Ku'ili hill and Hualalai Mountain to the south and the Big Island coastline to the north. Each spacious guest suite includes its own outdoor shower, walk-in closets, and privacy lanais. Pristine, natural landscaping surrounds the home, and the large lot gives an open feel and a gorgeous environment to live and play. Each guest suite includes its own Sonos sound system, comfortable bathrooms with private outdoor showers and its own lanai. Ideal for those seeking an active lifestyle, a long lap pool extends off the lanai and a three-car garage allows abundant storage and equipment space. Kua Bay's sandy beach is just minutes away, along with the sports complex and other first class amenities of Kukio and Maniniowali. Located above the town of Kailua-Kona, the Kona Vistas subdivision consists of residential lots that are a minimum of 15,000 square feet with unobstructed views of Kona's spectacular coastline. This is one of two homes constructed by Nicholson. A contemporary floor plan perfect for indoor outdoor living designed to take full advantage of the panoramic views. Pauoa Beach located in the Mauna Lani Resort area is a new gated community of custom homes built along the ocean and fronting Pauoa Beach. Adjacent to Mauna Lani's two championship Golf Coures, the Fairmont Orchid and the Mauna Lani Hotels. Pauoa's private Beach Club facility includes a 100 ft. long lap pool and Jacuzzi, a 2,000 sqft air-conditioned work-out facility, and a mens and womens locker room facilities that include Jacuzzis, sauna, steam, private outdoor massage rooms, and showers. The Kaupulehu Beach Club is the main member facility located in the Kaupulehu Development. Designed by de Reus Architects, the club features an open air bar and dining pavilions.